Paddle Boarding Takes Laurel South by Storm!! What do celebrities such as Matthew McConaughey, Jennifer Aniston, Brody Jenner, Matt Damon, and Kate Hudson have in common? They’ve all fallen victim to the latest craze in water sports and fitness: Paddle Boarding. Paddle Boarding combines the tranquility of being on open water with the benefits of an incredible full-body work out that especially targets the core. The origins of Paddle Boarding, or Stand up Paddle Surfing (SUP), are ancient. Hawaiian kings have been practicing Ku Hoe He’e Nalu (to stand, to paddle, to surf, a wave) for hundreds of years. In the 1960s, Hawaiian surf instructors began using Paddle Boards in order to watch over large groups of students at one time. Not long after, surfing legends such as Laird Hamilton and Dave Kalama started to take up SUP as a way to train when the waves were not high enough for surfing. Today, Paddle Boarding has been gaining popularity at breakneck speeds as celebrities, fitness gurus, surfers and countless others have touted its tremendous benefits. One of the great things about SUP is that, unlike surfing, it is extremely easy to learn. Most Paddle Boarders become very comfortable standing on their board within an hour of getting on the water. 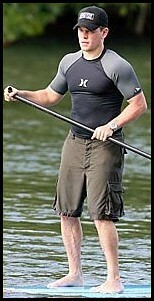 SUP also has incredible versatility. You can think of it as either a competitive racing sport, a great workout, or a peaceful way to experience nature. Lately, Yoga on Paddle Boards has even been gaining in popularity. No matter what you’re interested in, Paddle Boarding is a fun and exciting activity that people of all ages should experience. This summer, Laurel South is adding Paddle Boarding on Crescent Lake as a new activity that we’re very excited about. Try it out, you’ll fall in love! This entry was posted in Uncategorized and tagged benefits of camp, camp activities, camp counselor skills, education at summer camp, paddle boarding, sup on June 5, 2011 by Camp Laurel South.